I am forever on the lookout for new graphic artists and animators to follow, so we headed to DesigerCon at the Pasadena Convention Center on Sunday. 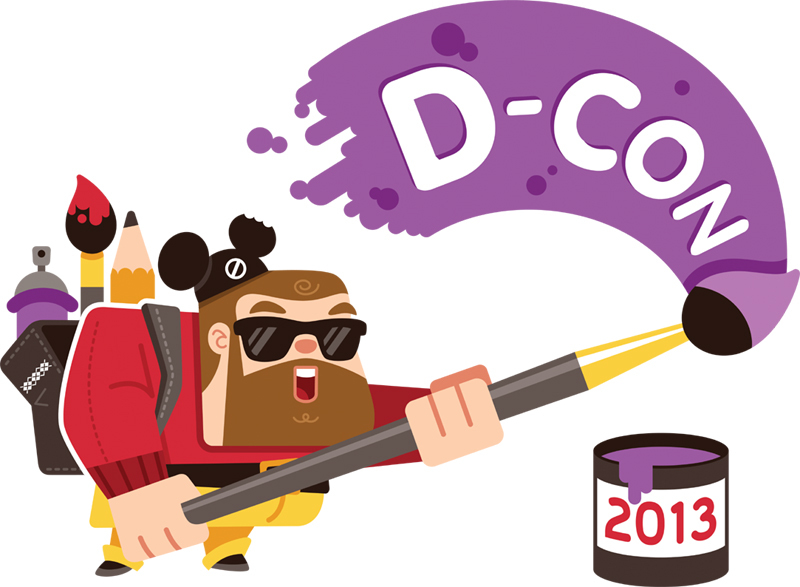 DCON has been around for 8 years, and is a convention that fuses urban, underground, pop art with animation, vinyl collectible toys, and clothing. The result was a mass gathering of manufacturers, retailers, artists, fan boys and fan girls alike who all share a passion for collectibles. What I loved about this convention was its energy and accessibility. With over 150 vendors there’s bound to be something that resonates with you whether it’s pop surrealism, anime, plush toys, sculpture, or street art. Since it was my first time at DesigerCon, I have to admit I was overwhelmed, especially since I didn’t know what to expect. Luckily one of our first stops was the booth one of my favorite bloggers, Supahcute. She partnered with graphic artist and designer Vanessa Ramirez to present a collection of resin collectibles alongside artwork by Jared Andrew Schorr and Jerrod Maruyama. Supahcute’s resin Millypus figures by Vanessa Ramirez. The prototypes were a hit! Adorable! This collage was a collaboration between Schorr and Maruyama featuring characters from Hayo Miyazaki films. 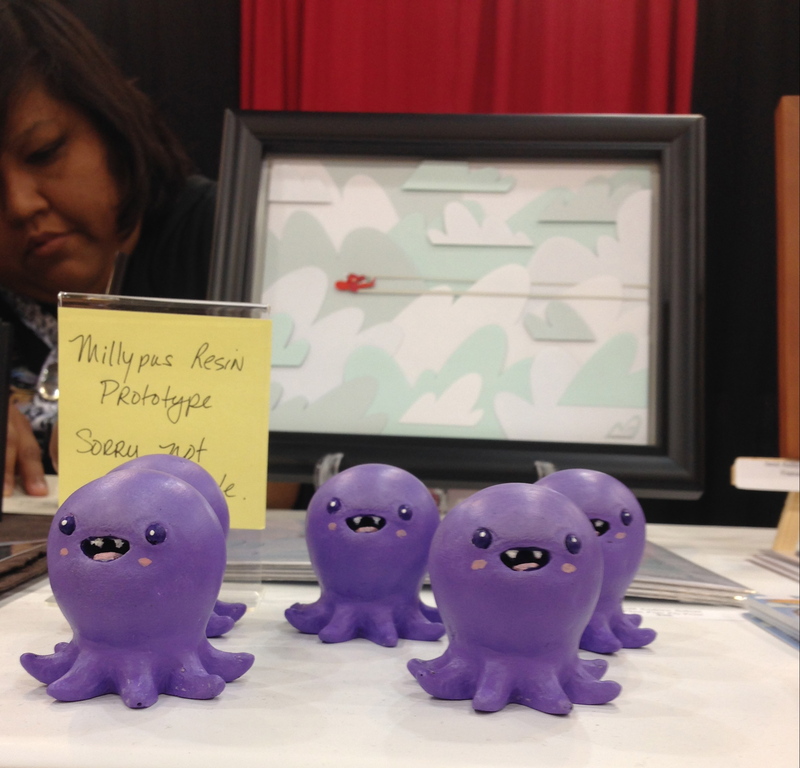 Supahcute gave us some DesignerCon newbie tips and suggestions on booths to visit. First up was Martin Hsu’s booth. 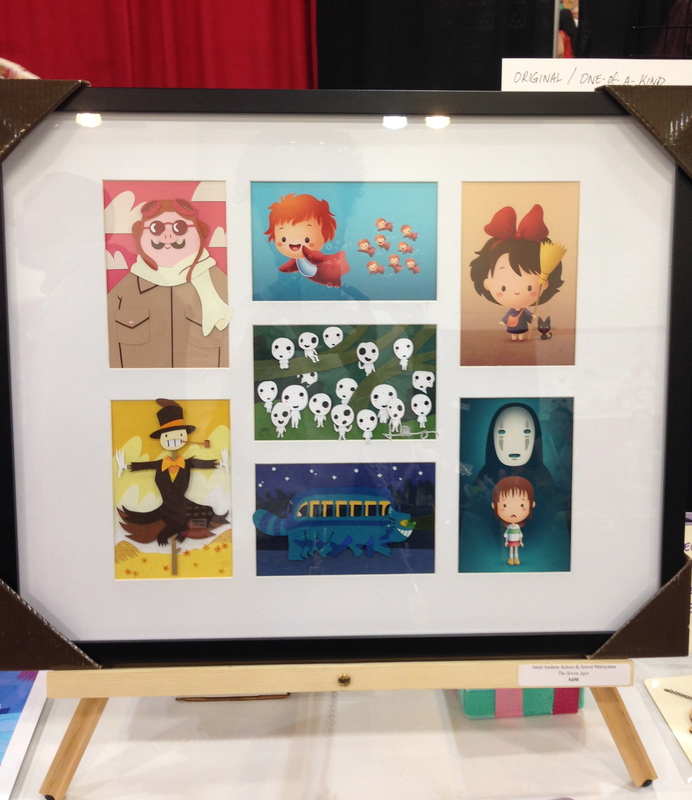 My husband is a big Miyazaki fan and Hsu’s work is heavily influenced by the film director. 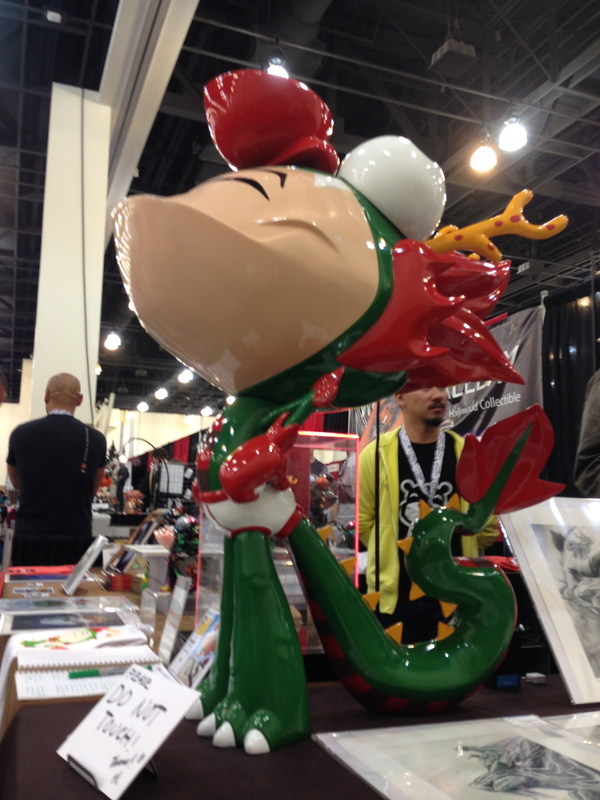 Hsu has some amazing character animation work and his Dragon Boy character was prominently on display along with some custom painted pieces by Mark Nagata. 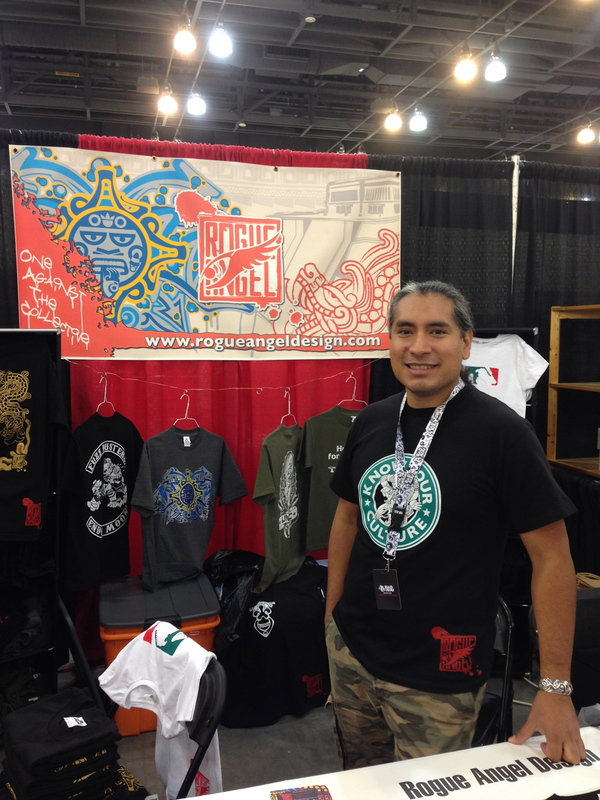 There were some fantastic clothing designers, and one of my favorites were the t-shirts designed and screenprinted by Rogue Angel’s Angel Mendoza. 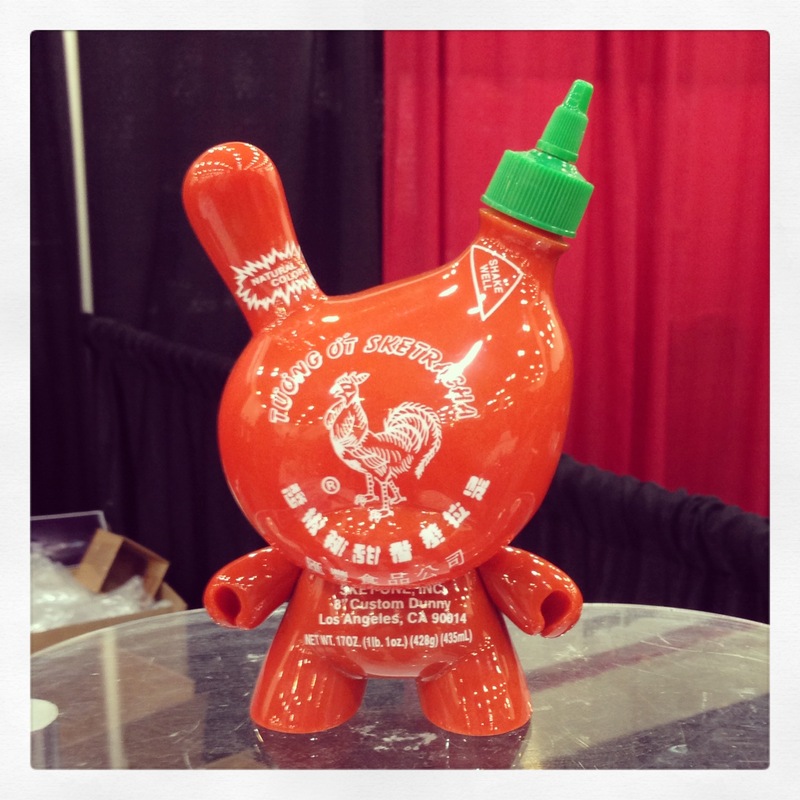 I really, really wanted this bottle of Rooster Sauce designed by an artist and fabricated by the folks from Mana Studios. Next up was a unique collaboration between Montreal street artists 123 Klan, OG Slick and his clothing company Dissizit. Slick’s LA Hands are everywhere and it was great to see their clothing and the LA Hands vinyls. We were lucky to meet them on Sunday and talk about collaborating and participating in this event. Fans of street art gathered to get signatures from the artists and it was nice that they were all so accessible and eager to talk about their work. There’s one theme that resonated with me at this conference. Collaboration. Everyone participating in this event was supportive of each other and it was so great to see artists inspired by each others’ work. I am not a ComiCon person, but if I had to guess, 2013’s DesignerCon is what Comic-Con was 8-9 years ago before the massive crowds and studios got hold of it. There was a positive energy among hobbyists joined by their shared affection for each other’s work, it was palpable. We didn’t leave the Convention center with a collection of vinyls (we did get some t-shirts), but I left with a better appreciation for Low Brow as a uniquely Los Angeles movement while being encouraged by the positive collaborative environment.